After you’ve been in the military for 20 or more years, where do you consider home? You’ve moved at the will of the military for so many years, so how do you choose where to plant your roots? Finally, after countless moves and deployments, the choice of where to settle is yours. Instead of just throwing a dart at a map to find your next home, narrow your decision by considering job opportunities, proximity to family, schools and lifestyle for children, and the cost of living. Choosing where to live isn’t the only difficult decision to make. Once you find your location, the house hunting process begins. Rent, search, save…or buy right away? If you’re certain you’re intent on staying in your new location long-term, it would be wise to consider purchasing a home. But if the right fit isn’t there for you immediately, renting for a short period will give you time for a more thorough search and to save money for a down payment or future home improvement projects. 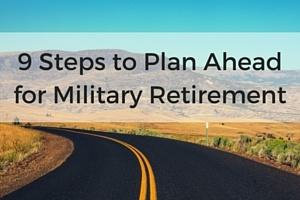 Consider the following factors when making your decision to either rent or buy after military retirement. For an ETS move, there's terminal leave, also known as transition leave, where you must use up all your accrued leave before your ETS date. Virtually everyone gets at least 1-2 months of terminal leave. But it's important to plan so that you can store up your unused leave to use. You can also request permissive TDY for transition, which is usually an extra 20-30 days if (and only if) you are looking for a job or house; if you already have employment lined up, you cannot work during PTDY (you can work during terminal leave). If you’re using a VA Home Loan, remember the rules and regulations as part of your loan agreement. You are required to move into the property within 60 days of closing on the home. Some veterans close to retirement may want to purchase a home, but can’t move in within the required 60 days because of their military retirement date. In individual cases such as this, the VA will consider special circumstances to allow the veteran to purchase the home even if they wouldn’t occupy it within 60 days. It’s necessary to have work lined up if you want to buy a house at your new location, as lenders will want to see that you’ll have a source of income. Otherwise, rent and then look for work and a house. As you embark on your final PCS, remember that it may not be paid for 100 percent by the DoD. For your ETS move, the military will reimburse you the cost of moving to your home of record regardless of where you go. Therefore, if your home of record is in California but you are moving to Oregon, the military will cover the costs to ship your items to California, but the rest of the way comes out of your pocket. (The services vary on how this is handled, so be sure to check your particular branch). Congratulations on your retirement and this next phase of life!